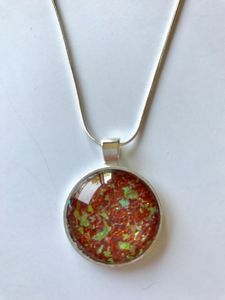 Made with mixed media, this pendant is handmade by me. Each one is unique, and they come in a variety of colors. 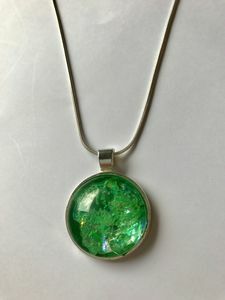 The pendant is one inch in diameter with a glass dome. Each one comes with an 18 inch silver chain. These arrive in an organza bag, and make great gifts! Hi! I am an artist located in Chicago, Illinois. 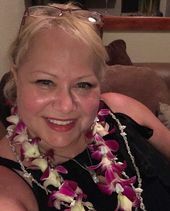 I created these pendants while on vacation on Maui. Inspired by the reflections of the sun on the water and the sparkle of the sand, I created these using mixed media. 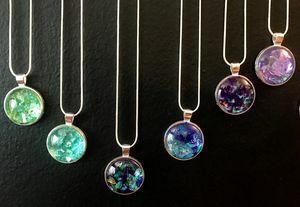 They come in any color and come with an 18 inch silver chain. They arrive in an organza bag and make great gifts!